Ehtisham Bilal, 20, who was studying BTech, had gone missing after he was roughed up by students at Sharda University in Noida. Ehtisham Bilal, the missing Sharda University student who had allegedly joined the Islamic State, was arrested by Jammu and Kashmir Police from his house in Srinagar on Sunday. Ehtisham had gone missing last month after he reportedly boarded a Delhi to Srinagar flight and his telephonic conversations were last traced to the volatile Pulwama district. An audio message soon went viral on social media in which Ehtisham allegedly was pledging allegiance to ISIS chief Abu Bakr Al Baghdadi. Ehtisham's parents Bilal Ahmad Sofi and Irfana had made repeated requests on social media asking him to return home and shun the path of violence. On Sunday, Bilal Ahmad Sofi told mediapersons in Srinagar that Ehtisham was seriously injured and bleeding from his mouth when he reached home. "Soon, the Deputy Superintendent Khanyar Police Station came to our house and arrested him," Bilal said. The J&K Police had earlier busted an ISIS module in Srinagar which comprised the local youth including a student of Jamia Millia Islamia in New Delhi. The police said that the ISIS is yet to establish its proper base in the valley although some boys who are inspired by its ideology have attempted several times to form a base here. 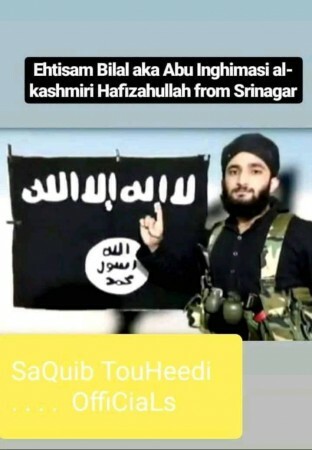 ISIS's Kashmir wing is headed by Zakir Musa, a former aide of Hizbul Mujahideen commander Burhan Wani, who according to reports was last spotted in Punjab.